Well. If I was to write in the way that I feel these days, there would be no punctuation. There would be a single long sentence from which not only the full stops and commas would be absent, but towards the end of the page, the spaces in between the words would be absent too. On the one hand, I am very jolly and in control, and on the other hand, I am feeling slightly breathless that things are moving too fast. I am wondering if I shall ever see an afternoon lying on the sofa filing my nails and peeling grapes ever again. I have been aided this week by my very calm and tired new Hungarian lodger. 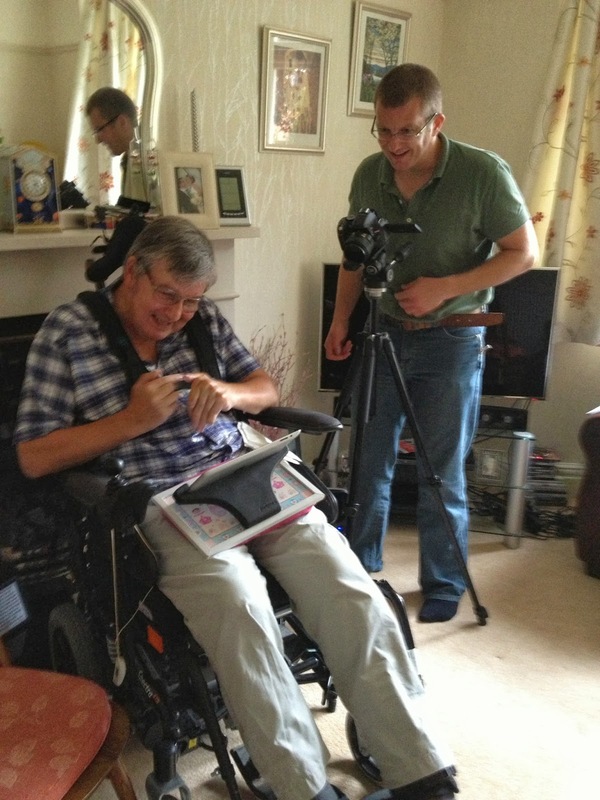 He has been taken to Mike with MND's house and asked to make a film for me. "Make it interesting," I said, "I want to use it on Thursday at the next AGD thing at Brighton Uni Med school." I will never know whether he came because he was unsure that perhaps in order to stay in my house as a lodger, there were certain tasks to complete, like Jason and the Golden Fleece, and he must be prepared at all times to undertake the seemingly impossible. Or that Fate showed him the advert for the room in my house, knowing that deep inside, he had always wanted to make a film with his new camera and tripod, and this was the very house to launch him on his new career. Mike being filmed by Endre, a Hungarian Martial Arts Expert, who only wanted a quiet life and ended up in my house. The film has been done. The final edit is tomorrow, and it will be shown on Thursday instead of Mike himself. Mike's condition is deteriorating and he is not able to come in person, which was what we had planned in the Summer. I am quite surprised that I had the audacity to ask a stranger to come and make a film of someone for me, and for that stranger to say yes and then make an excellent film. After Thursday, I want to put it on our AGD channel on YouTube, and you can all see not only how Mike and his wife Michelle speak of their lives with MND, but you can see the skills of my lodger as a film maker. I am very grateful to Endre, he has done a wonderful job and I hope that he may do more filming for me, and perhaps remember Mike, Michelle and me when he is in Hollywood. This is what we are making the film for. It is open to the public, and is free, but you are asked to book. I will add the link to this page with the booking information below. A Graceful Death started with the death of Antonia Rolls's partner, Steve, in 2007. She painted him to help her find a way through the distress of seeing someone that she loved, fold up and disappear into cancer and death. In 2009 she tentatively staged the first Graceful Death exhibition in her home. There was a mixed reaction; some loved it, and some didn't. The paintings were raw, powerful and moving, showing the human body as the cancer changed it, right up to the hour after death, when all the tension in the body was gone. The response from this first exhibition led to other people asking if Antonia would paint them, or someone that they knew, who was dying, and so, the Graceful Death exhibition began. Antonia paints people facing the end of their lives. The idea is to see someone who is dying exactly as they are, changing nothing: the skin colours, the lack of muscle tone, the fragility, the power of life still in the eyes. "When I paint someone, I cut to the chase, dispense with the give and take of a normal social interaction, and ask, "Who are you? What are you saying? How do you approach your death? What is happening?" And people want to tell us the answers. They want to be listened to and most of all, they want to be seen. " The exhibition highlights dying and death as common, daily, normal and deeply human. Antonia will include much written text and some film in the exhibition, in order to capture words as well as images. The exhibition contains 52 paintings, including poetry donated by the public and written at the Graceful Death Poetry Workshops. Antonia will be talking about the journey she travels as she paints people nearing the end of their lives or living with complex neurological conditions. She will be joined by Mike Hardy who lives with Motor Neurone Disease and who is featured in the exhibition. There will also be some film of an interview of Julia Wilson, our other MND sitter, taken by my dear colleague and friend, photographer Eileen Rafferty. Julia died on the 9 August, and was to take part in this event. I am glad she will be joining us, and we will honour her memory. Thursday October 3 - AGD at Brighton Uni Med School, as above. 6 - 8 pm and after the talk till about 10 I expect, milling and chatting as the exhibition will be up in its entirety. Friday 1, Saturday 2, Sunday 3 November - AGD and Soul Midwifery exhibition in the Unitarian Church in Bridport, Dorset. Exhibition runs throughout, with concerts, workshops, discussions and endless opportunities to meet the AGD and Soul Midwifery team, and talk about our work. We are delighted to have Felicity Warner, the author and founder of the Soul Midwife movement to come and talk, and for Soul Midwife teacher and practicioner Mandy Preece, Soul Midwife and musician Lizzie Hornby, and Soul Midwife and Sound Therapist Sarah Weller to come and run workshops and give concerts and inspire you. All details coming up very soon. Sound has a profound effect on our lives impacting and impinging upon everything we do. Even the sound of silence has an important role to play. Sound is a vibration. Everything we see or can sense is a vibration. Situations in our lives are usually a reflection of something happening in our psyche just as our surroundings have an effect upon our moods and general disposition. Using Sound as a tool we can learn to manage both our internal and external environment to our advantage and for the benefit of those around us. Using very simple yet powerful techniques we can quickly and efficiently find a sense of calm and equilibrium. Sharon Galliford, a Healer and Sound Therapist, will guide you in this experiential workshop which will be in two parts. The morning will focus upon the beautiful simplicity of toning and its application for relaxation and healing. The afternoon will introduce sound for chakra balancing and pain relief. Active participation will enhance your personal experience of sound therapy and equip you with tools to take with you into your everyday life. A singing voice and musical ability are definitely not required… I have neither myself! 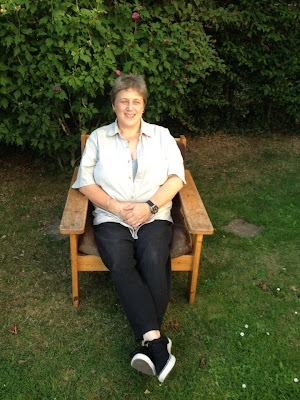 Sharon's one to one soul readings with astrology are very wonderful. As a healer, all the work that Sharon does is healing, and I loved having my readings done with her. We will be charging a fee for this weekend, and as ever, there will be much more detail soon. It will be an inspiring weekend. Saturday 7 December - AGD presents a Warm Winter Therapy event with my lovely friend Bette Ward. Cakes by Kirstie's Kitchen (I am addicted to Kirstie's cakes) here in Bognor, with gifts, cards and lovely hand made and crafted items for sale. Reiki healing healing sessions will be running alongside Bette's sessions, from my studio. 2pm to 8pm, mince pies, snacks, hot drinks and warming Christmas fare all day. 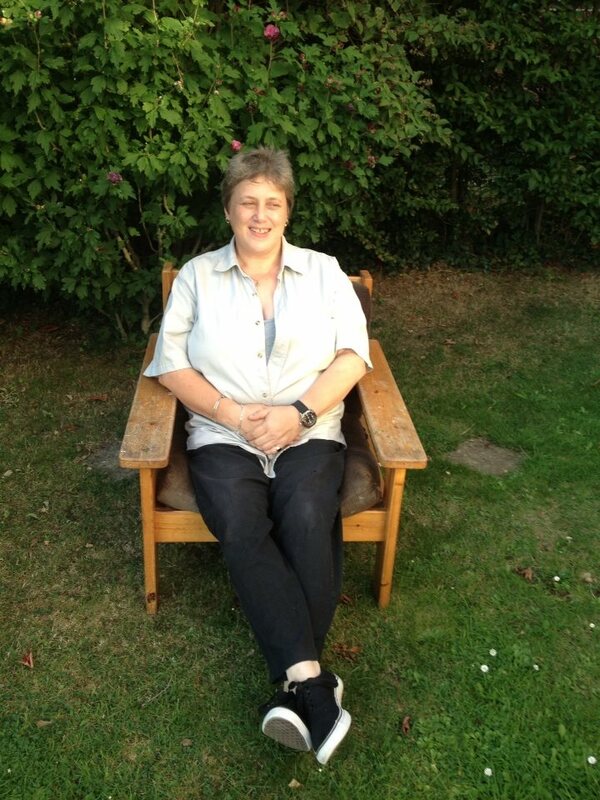 Bette will be providing taster sessions of aromatherapy, hand and foot massage, head and neck massage, and will be soothing us all by her gentle healing presence. Free, donations to AGD appreciated. All welcome, come and mingle and see what is going on whether you wish to have a session or not. Drop in or stay the whole day. Aged 53 and at last, in a night club with dry ice and laser lights. My new spiritual home. I feel I have waited many years to be allowed into a night club like this, with non stop dry ice and laser lights. 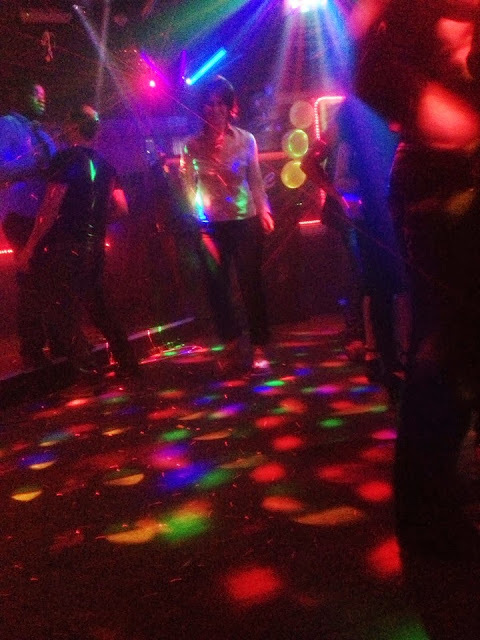 I went to Luton with my friend Bette last night and ended up here, and now I am wanting dry ice, laser lights, and 80s and 90s music for AGD. I fear my boundaries are getting all muddled and I need to re-establish that A Graceful Death is one thing, a night club is entirely another. I am glad that I didn't know about dry ice before I took Endre to film Mike, it could have been a whole new take on MND. Did Jackie have her hair shaved last night? Yes. Indeed she did. 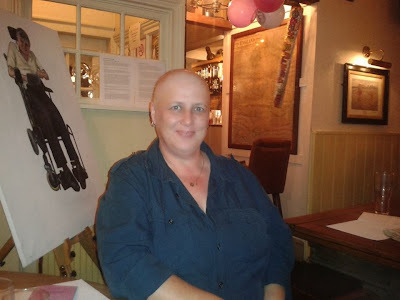 Last night Jackie had her hair shaved off by Paris from Simpy Hair in Bognor Regis, for our awareness and fund raising event Going Bald in Aid of A Graceful Death. I know for a fact that Jackie's hair had been falling out by the handful, and it has been very uncomfortable for her. We needed to have at least some hair for the event, otherwise we would have to have had Polishing Jackie's Head in Aid of A Graceful Death. So, Jackie was instructed to sleep sitting upright, with cling film on her head, and not to sneeze or move at all, until Friday at 9pm when Paris was going to shave her head to thunderous applause and cheering. Well, dear Jackie, ever helpful and ever game for a laugh, ignored the advice and carried on as normal while wearing a hat, and so last night, was put out of her discomfort (no hair washing, was one of the things that Jackie did for AGD before the run up to Going Bald for AGD, God bless her) and the last of her hairs were removed. And blow me down, didn't we all think she looks fab like this? We were entertained by Quiz Master Extraordinaire, Alan, who prepared some excellent questions and organised four teams who actually answered the questions. Very early on, I realised that I was not going to be much help to my team, so smiled and looked pretty instead. I didn't know anything. "I live," I told them, "in a bubble of my own, the outside world does not enter." They seemed to accept this, and I thought it let me off the hook, so all was fine and we all relaxed. Alan asking some very hard questions. As I was in my self imposed bubble, where the rest of the world does not enter, I was free to take the photos. A real stroke of luck yesterday saw us receiving a £50 Amazon Voucher for our raffle, donated by Nigel Neville of the Rotary Club of Bognor Hotham. Nigel came along to the event and we were delighted to welcome him. The following businesses, apart from the Rotary Club for Bognor and Hotham, donated for our raffle. We are so thankful to all of them. Paris from Simply Hair donated not only her time to come and shave Jackie's hair, but a voucher for a cut and blow dry. Jackie! Not only is she undergoing chemo, feeling rough, having to sit still for a week so her friend can organise a fund and awareness raising event round her, but she donates 4 bottles of beer too. Amazing. And of course, Dave from the Walnut Tree pub donated the room, and his help, for the evening. I understand now why everyone says they know Dave and the Walnut Tree, it is rightly a wonderful place to eat, drink and be merry. What is next? I shall answer that in two sections. Section A is "What is next in your life, Antonia" and section B is "What is next for AGD"
Section A "What is next in your life, Antonia?" I am utterly pooped. Thank you for asking. My house needs cleaning, and I want to eat brown bread and butter and jam a lot. But, onwards and upwards. Today, my ex sister in law remarries, and I am going to the party with my daughter. She and I are going to dress up to the nines, because my ex sister in law would love that. But what to wear! A big white dress would not do. My pyjamas? No, even if I am this tired, my ex sister in law would see through however much I jazzed them up. I have a very high pair of cream shoes, and I am building my outfit around these. So far, I have decided on my tights, soon I will decide on a dress to go with them. I have a few hours before I have to go and collect poor Daughter from her nursing shift in Brighton and make her dress up and come with me for a night out in Eastbourne. I shall arrive as if I knew all along what I was going to wear, and no one will know it was nearly jazzed up pyjamas. Daughter may well put some lippy on and go in her nurses outfit after a cup of tea and a brief nap. She too is pooped big time. Actually, those that know her, know that daughter would rather shave off her eyebrows than go out into the public looking less than perfect. She will transform into Dolly Parton and we shall have a wonderful time and she can sleep in the car. I can't. I shall drive slowly and listen to Radio 4 with my windows down. Section B "What is next for AGD?" AGD goes to Brighton University Medical School on the 3 October. I was hoping to have Mike with MND join me for the evening and be interviewed as part of the presentation. (See the painting of Mike behind Jackie with her shaven head above). Mike is not too well at the moment, and is not going to be able to cope with the long journey there and back, and the time in front of the audience, and so I have hastily reverted to plan B. Plan B is to find someone with a camera to come and film an interview, the interview Mike and I had agreed upon, and spend the whole day with me doing things for AGD. Who to ask! Eileen is overwhelmed with work, and in London, Jackie was not up yet due to just having had more chemo, Alan may not have a camera that can take film - and so I asked my new lodger, as he arrived into the kitchen at that moment. I know that he has a camera, and he has been in my house for nearly a week, plenty of time to have settled in. I now have a startled and well behaved Hungarian martial arts expert coming all the way to Dorset with me to film me and Mike and Mike's wife Michelle, talking about having Motor Neurone Disease. On the one hand this seems most unorthodox, on the other, what the hell. If a Hungarian martial arts expert has no objection to an adventure of sorts with his landlady, then I have no objection to making a Hungarian film for my A Graceful Death exhibition and project. 1, 2, 3 November "A Graceful Death and Soul Midwife Event" in Bridport. A celebration of end of life awareness, and thinking. We are delighted to have author and founder of the Soul Midwife movement Felicity Warner to give a talk, and healer, Soul Midwife and second in command to Felicity, Mandy Preece to give a workshop. We have a concert by musician and composer Lizzie Hornby, who has composed music for AGD, and we have Soul Midwife and sound therapist Sarah Weller of Sounding for the Soul giving a sound bath and talk on her work with the end of life. More on this very soon. Some time in December an evening of fun, awareness and luxury with my lovely friend Bette Ward. Bette will be offering pampering therapies for the evening in my home here in Bognor, and while not having a small session of reflexology, Indian head massage, or Swedish massage with Bette, we will eat mince pies and Christmassy fare, and drink fruit punch and tea. More on this soon too. Before I go (probably to sleep) I want to thank Jackie Keogh. Jackie does not complain, she does not give in, she keeps laughing and helping others, and is having some fairly tough chemo. Because of Jackie, I had the most wonderful event last night, and met and talked to more people about the work that I do, and how I do it. We raised money to help us put on our next event, and none of this could happen without Jackie. And, incidentally, it was Jackie who contacted Nigel Neville who then donated the £50 Amazon Voucher for the raffle last night. See? Jackie is a bit of a star. Thank you Jackie. Outside my window this dark September evening, a storm is raging. I see through the rain and wind the shapes of the hollyhocks lashing out and smacking anything that comes within nine foot. I am cosy, tonight I have put on the heating, and I feel the desire to curl up under the sofa and go to sleep for eight months. I am amusing myself thinking of my hollyhocks as Guard Hollyhocks. Charming, but lethal. A Graceful Death and Sounding for the Soul, how did it go? The event was dedicated to the memory of Julia Wilson, who died on the 9 August. Julia had Motor Neurone Disease, and allowed her image and her story to join A Graceful Death. I am privileged to have met and worked with her, and thank her, wherever she is, from the bottom of my heart. The venue was donated to us through the kindness and support of the Bognor Regis Lions, a fund raising charity here in Bognor. Thank you to our hosts for the wonderful day. It was a small but vibrant group of people that came our way on Saturday. Some people had to cry off at the last minute but we know where they live and they will be summoned to another workshop event very soon. Sarah and I set up with the help of Jackie, sitting on her chair on the left, and my daughter Fancy Girl, and her friend Sweetheart Girl. Here we are posing professionally, calm and sensible before the event started. 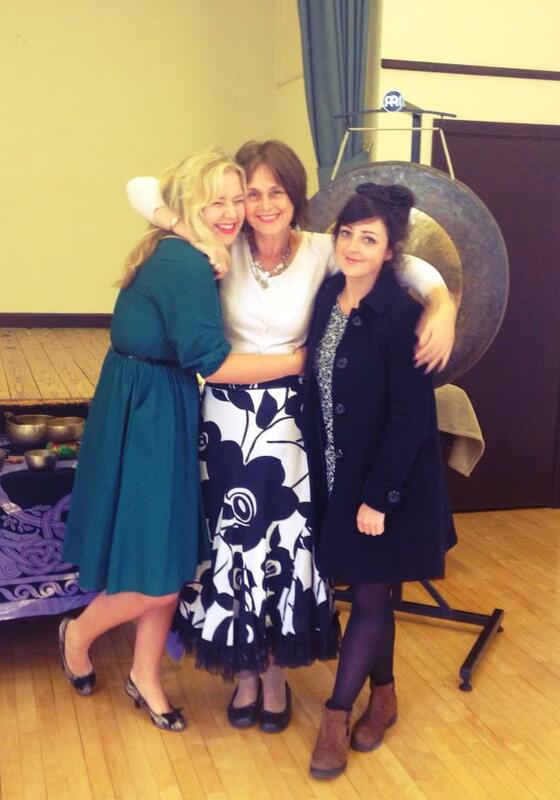 We pose by one of Sarah's gongs and next to some of the Tibetan singing bowls. Thank you to all who came, thank you to all who helped and thank you to all who spoke of their own stories, which never fail to impress and move me. Sarah's Sounding for the Soul workshop and sound workshop was a very powerful and interesting session. Some of our group were not at all sure that this was a sane thing to do, but by the end of the sound session and sound bath, as I knew they would, they were deeply in love with the gongs. All in all, a very sound experience ho ho ho. The next event is only days away! This coming Friday, the 20 September, Jackie here is having her hair shaved as a fund raising event for A Graceful Death. 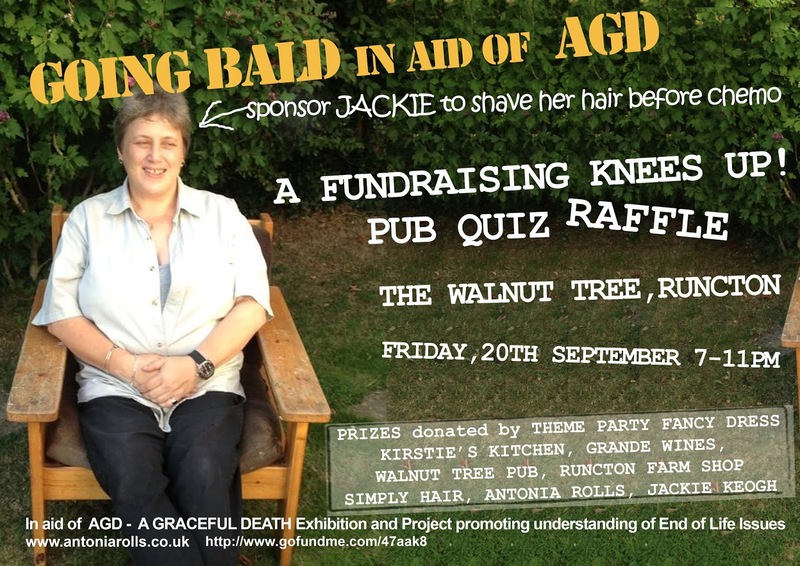 Jackie is undergoing chemo for her cancer, and despite feeling rough, has offered to do this at the Walnut Tree pub in Runcton. Being party kind of girls, Jackie and I have decided that the best situation in which to shave a lady's hair, is at a knees up. And so, you are invited to the Knees Up, this coming Friday 20 September, from 7 - 11pm, entrance free, for a laugh and a lot of cheering for Jackie. Come early and eat, the food is excellent. Going Bald for AGD is raising funds for the continuing of the A Graceful Death work and message. The A Graceful Death exhibition creates a space and an opportunity for us to address how we approach the end of life. The people who are painted in the exhibition tell us how it is for them, and show us that dying is something that can be done. Dying is normal, and many of the sitters long to tell their stories to help others face their fears, and share with us their image in the portraits. The portraits are honest, powerful, raw and full of love. A Graceful Death's message is that until we are dead, we are very much alive, and it is that life that the exhibition and project aims to celebrate, especially as someone is dying. All money raised goes to help take the exhibition out into the community to raise awareness of what it means to die, and what it means to be living well right up until the end. I work too with people who need an end of life companion, at whatever point during their final journey. This work is not part of the exhibition unless requested, this is private and one to one, and entirely for the person, and sometimes the families too. For this work, I come and visit for as long or as short a time as is requested of me. This is very precious work, as sometimes time is of the essence. 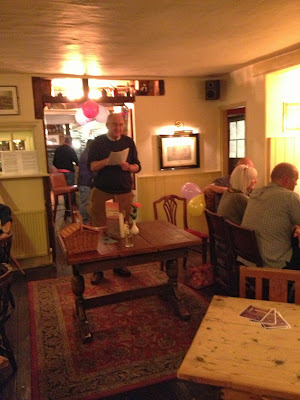 Come to the event at the Walnut Tree, join us for a knees up and perhaps, win the pub quiz (Alan is the hard task master running the pub quiz, you will have to sharpen your brains. He won't let you win easily) You stand a chance of winning a raffle prize, and if it is seriously your night, you may win them all. And now, before I go, let me tell you that last night, my friend Stuart who is part of the exhibition, stayed with me after the exhibition. What did he bring me? A hollyhock in a pot. I shall plant it in an area where it can't reach anyone. I love hollyhocks, and Stuart is a treasure for bringing me one. Thank you Stuart. (Bam from the hollyhocks outside). Hollyhocks! Both Amazing and Annoying. And What's On for AGD. I am filled today, with gentle paradoxes. There is no discord in the house, there is a silence and a peace. Outside my window, my treasured hollyhocks are growing as they do, straight into the path of anyone who wants to pass them. Am I, I ask my self, in a moment of whimsical self analysis, a human hollyhock? Do I grow tall with flowers on me straight into the path of innocent passers by? Here, my friends, is the first of the gentle paradoxes. I am a hollyhock, and I am not. Before we look at the human hollyhock paradox, let us look at some of the other gentle paradoxes that float about as I sit in my silent, peaceful house, and write this week's blog. Today, there is nothing happening. And yet, everything is happening. Sitting here in my sitting room, I have resisted putting on the radio and distracting myself. Instead, I have sat on my sofa and thought, "What, exactly, am I feeling?" And from that question sprung the first of the paradoxes. "I am feeling," I said to myself, mug of tea halfway to my lips, a debris of boiled eggs and porridge on the tray beside me, "I am feeling, both everything and nothing." At that moment, I glanced out of my window to the hollyhocks growing at right angles to the house, directly into the eyes of anyone who is passing. They are my pride and joy. I have longed for hollyhocks in my front garden and now I have loads. I love how they look and the colours they are, but they are a liability. They bop themselves on your head if you stand too near, they grow into your face as you pass, they look so beautiful from a distance but as you get closer, you realise that they are about nine foot tall and about as gentle as a big puppy dog wanting to play. They are both glorious and annoying. Am I, I wondered with a moment of insight, both glorious and annoying? 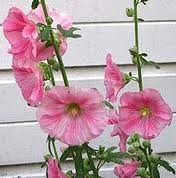 I began to identify with the hollyhocks and I began to look for similarities. The answer that came was, "Yes. You, along with the rest of human kind, are both glorious and annoying. It's a human thing. And if you, with time on your hands this morning, identify with a hollyhock, well, whatever makes you happy." Today is a day to ponder, to think, and to do things without planning them. This silence is doing me no end of good. Or not, if the hollyhock thing worries you. I have much to do, and maybe it will all get done while I do nothing. I have no time to read, but I will probably finish my book today. The house is humming with the feeling of space, yet it is full with lodgers, Giant Boy, and his friends. Despite, or maybe because of, the paradoxes that are keeping me pleasantly distracted today, I shall tell you now what is happening in the next few weeks. 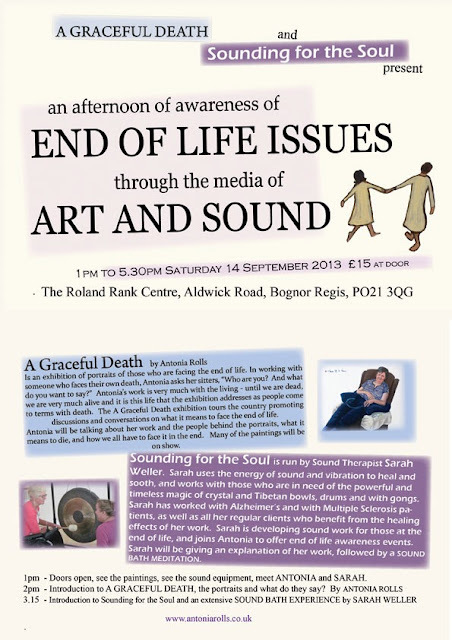 A Graceful Death and Sounding for the Soul Presents An Afternoon of End of Life Awareness through the Media of Art and Sound. Saturday 14 September, at the Roland Rank Centre here in Bognor Regis. Sarah Weller, of Sounding for the Soul, and I, dedicate this to the memory of Julia Wilson, who gave AGD the benefit of her image, her story, and her experience of Motor Neurone Disease. She died on the 9 August, and we are honoured to have had time with her with A Graceful Death. Tea, coffee and cake included from start to finish. That's made you decide to come now, hasn't it. We are extremely grateful to the Bognor Regis Lions, a wonderful local charity, who have generously donated the Roland Rank Centre to us for this afternoon, in support of what we are doing. Doors open at 1pm. Come and meet Sarah and me, meet each other, hear and experience the work that Sarah and I do, and tell us too of your stories. I will be speaking about my work, who is behind the portraits, how working with the dying affects me, my sitters and why I do it all. Sarah will talk about her work with Sound, and the best bit is the extensive Sound Bath she will perform for you all. And when you are not doing any of that, eat cake and drink tea. Jackie, with hair, tough and determined to go bald for AGD. I encourage her every step of the way. I would. Well. How about this. We are having a Knees Up at the Walnut Tree Pub in Runcton, on Friday 20 September, 7pm - 11pm. There will be a party that evening in the Walnut Tree, the space we are using kindly donated by Dave who manages the pub. 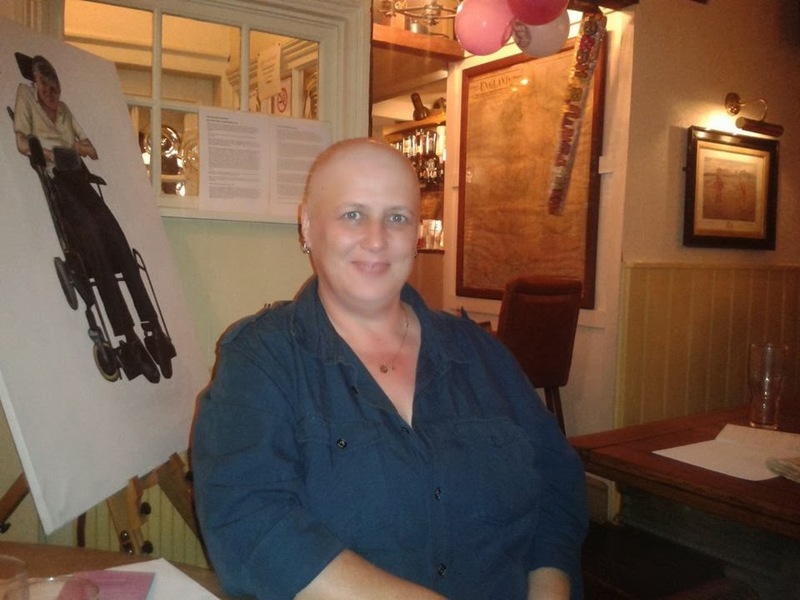 The central spot in the evening will be the shaving of Jackie Keogh's hair before the chemo that she is receiving for her cancer, gets it, to raise funds for the AGD exhibition and project. Paris, from Simply Hair Hairdressers in Bognor will be doing the shaving. There will be a pub quiz, a quid to enter, and prizes for the winners. There will be a raffle, with prizes galore, and there will be time to give donations for Jackie's amazing selfless act of madness. I have, in my generosity, promised to donate to her a rasta hat with attached dreadlocks for when she has no hair at all left. Joking apart, Jackie does not feel well at all, and I am so grateful for her wonderful spirit of fun and adventure. You can donate now at Go Fund Me, the website is safe, efficient and very easy to use. Have a look now, all the information and some words from Jackie herself is on the page on the link below. 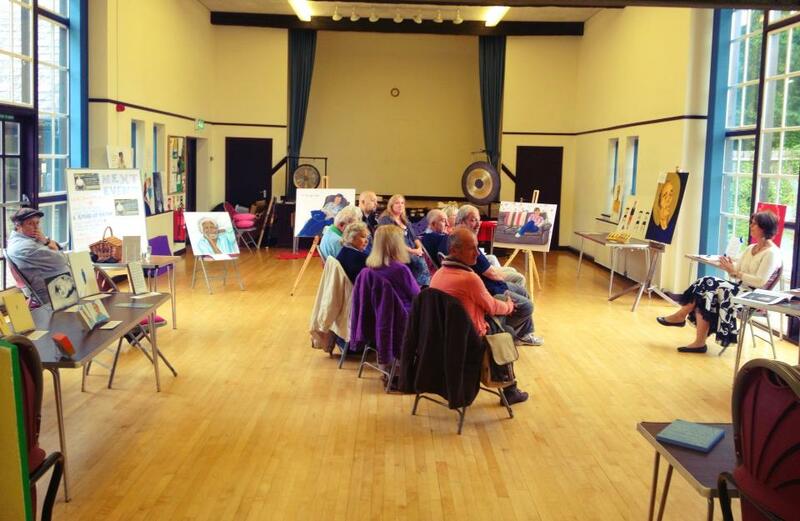 All the funds are to enable the A Graceful Death exhibition and project continue to work in the community, raising awareness for what it means to face the end of life, and working with individuals through art and creativity, as they face their final journey. Click on it and see if you can donate even a few pounds. And please, come and join us for the Knees Up on the day itself. In the spirit of being both amazing and annoying, I shall now go back to communing with the hollyhocks. See you on the 14th and the 20th. You cannot be paradoxical about being both there and not there, you will just have to be there, and consider being paradoxical about something else. Hollyhocks. Paradoxically, both amazing and annoying. Like us.